Almost 44 million Americans are student-loan debtors, and every single one of them should see Betsy DeVos as their mortal enemy. Since President Trump appointed her as Secretary of Education, DeVos has done nothing to ease the suffering of college borrowers. 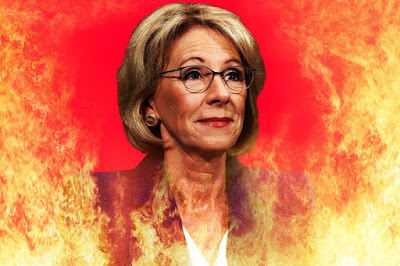 On the contrary, she has done everything she can to prop up the venal and corrupt for-profit college industry, which has preyed on vulnerable and naive students, many of them minority members or just plain poor. We have known for years that the for-profit college racket is a cancer. Senator Tom Harkin's 2012 report on the for-profits made that fact absolutely clear. And we know that a high percentage of people who take out student loans to attend these shyster colleges default on their loans. Nearly half of a recent cohort of borrowers who attended for-profit colleges defaulted within five years. It was recently reported that more than half of the students who took out student loans to attend 1,000 colleges and schools had not paid down one dime of their student loans seven years into repayment. Most of those 1,000 institutions are for-profits. Minorities have been especially injured by the for-profit colleges. Three quarters of African Americans who take out loans to study at a for-profit college and then drop out eventually default. In my view, the Obama administration did not do a great job of reining in the for-profit racketeers, but it did make an effort. The combined efforts of the Obama Department of Education and several state attorney generals brought down two bad actors: Corinthian Colleges and ITT Tech. These two organizations had a total of a half million students and former students at the time they closed and filed for bankruptcy. And the Obama administration put regulations in place to process students' fraud claims--claims against Corinthian in particular. But Betsy DeVos derailed those regulations and appears intent on protecting the for-profits from fraud claims. She's cooked up a bogus formula for resolving fraud claims, awarding only partial compensation to victims. As Steve Rhode noted in a recent essay, the DeVos DOE has not provided relief to a single student borrower who was defrauded by a for-profit college, although it has approved around 13,000 claims by former Corinthian students (while rejecting 8,600 pending claims). DeVos also nullified an Obama-era regulation that would prohibit the for-profits from forcing their students to sign covenants not to sue as a condition of enrollment. In addition, DeVos is slow rolling the Public Service Loan Forgiveness Program (PSLF), which provides debt relief to people who devote ten years to public service. Indeed, the Trump administration proposes to do away with the PSLF program. And if that weren't enough, the Republicans sent a bill out of the House Education Committee that would do away with student-loan forgiveness altogether. DeVos has not formally endorsed this bill, but she called it a "starting point." 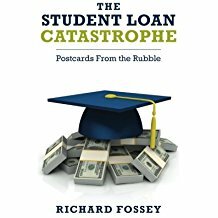 The bill, if it becomes law, would give student borrowers only two options--pay off their loans in ten years or go into a perpetual income-based program that would not end until the loans are paid off or the student borrower dies. Oh yes, and the bill would eliminate the authority of state attorney generals to police the student loan industry. And what have the Democrats done in response to DeVos' shockingly obsequious behavior toward the for-profit college racketeers? Not a friggin' thing. Senator Elizabeth Warren--self-proclaimed consumer advocate, writes stern letters to DeVos and other government bureaucrats, but she can't point to a single accomplishment in terms of student-loan relief. I give the Democrats grudging credit for at least introducing legislation that addresses the student-loan crisis. The Delaney-Katko bill (co-sponsored by 25 Democrats and one Republican) would open the bankruptcy courts to deserving student borrowers, which is really the only comprehensive solution to the crisis. But that bill will never make through a Republican dominated Congress that is totally beholden to the financial industry. In my mind, the litmus test for Congress in terms of student-loan relief is the Warren-McCaskill bill that would bar the federal government from garnishing the Social Security checks of elderly student-loan defaulters. Passing this bill would at least alleviate the suffering of the 114,000 older Americans who are seeing their Social Security income reduced due to unpaid student loans. It is not enough for Senators Warren and McCaskill to simply file this bill; they need to get it to a vote. What Republican would vote against that bill? Can't Senator Chuck Schumer and Representative Pelosi walk across the aisle and get Warren-McCaskill bill signed into law with bipartisan support? Frankly, if there is not enough good will between Republicans and Democrats to enact the Warren-McCaskill Social Security relief bill, which only provides puny student-debt relief, then student debtors should say the hell with both parties and form a third political party. In the meantime, Democrats should focus on getting Betsy DeVos out of Trump's cabinet. I don't know if her slavish catering to the for-profit-college gang amounts to high crimes and misdemeanors for impeachment purposes, but this I know: Betsy has got to go. Douglas Belkin, Josh Mitchell, & Melissa Korn. House GOP to Propose Sweeping Changes to Higher Education. Wall Street Journal, November 29, 2017. Jillian Berman. House Republicans seek to roll back state laws protecting student loan borrowers. Marketwatch.com, December 7, 2017. Danielle Douglas-Gabriel. GOP higher ed plan would end student loan forgiveness in repayment program, overhaul federal financial aid. Washington Post, December 1, 2017. Danielle Douglas-Gabriel. Dems raise concern about possible links betwen DeVos and student debt collection agency. Washington Post, January 17, 2017. Steve Rhode. GOP Proposed Change to Higher Education Act to Gut Consumers and Debt Relief Companies. Get Out of Debt Guy, December 5, 2017. Danielle Douglas-Gabriel. Elizabeth Warren wants the Education Dept. 's use of earnings data investigated. Washington Post, January 2, 2018. Paul Fain. Half of black student loan borrowers default, new federal data show. Inside Higher Ed, October 17, 2017. Andrew Kreighbaum. DeVos on Higher Education Act Rewrite. Inside Higher Ed, December 15, 2017. Jack Moore. Betsy DeVos may be Gearing Up to Screw Over Public Service Workers Who Expect Student Loan Forgiveness. GQ.com, August 3, 2017. Representative John Delaney press release. Delaney and Katko File Legislation to Help Americans Struggling with Student Loan Debt, May 5, 2017. Steve Rhode. Dept of Ed Puts Fraud First Over Students and Common Sense. Getoutofdebtguy.com, January 3, 2017.